Jello Cupcakes | Rosetta Bakes! Children and adults alike will love these cupcakes! You can have so much fun making them because there’s so many combinations of colors and decorations. 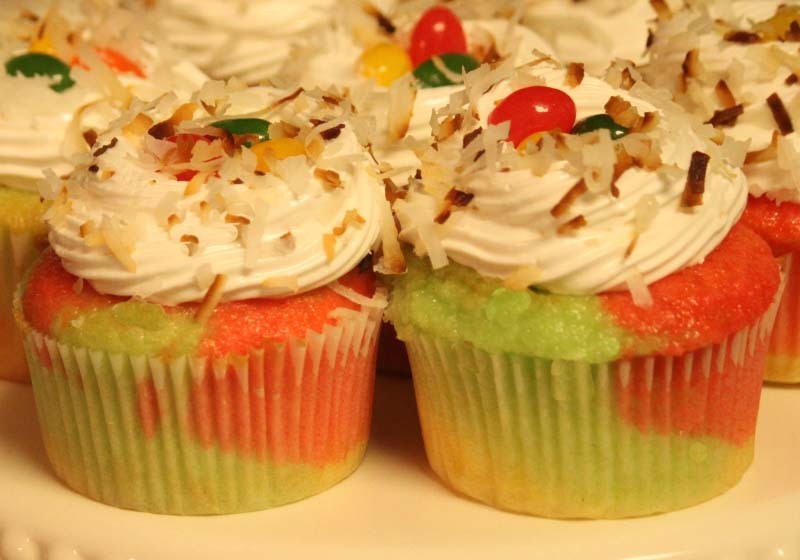 These are made with a white cake mix of your choice, but you can certainly make the cupcakes scratch. The icing is scratch, but you can certainly used canned if you like. So easy to do and the end result are colorful fun cupcakes! You can also divide the frosting and make assorted colors according to your jello colors and use jelly beans the same colors. Preheat oven to temp on back of cake mix box (usually 350). Place cupcake paper liners in cupcake pans *(I prefer to use grease-proof liners). Divide cake batter into three bowls. Pour in 1/2 box strawberry jello in one bowl, 1/2 box lemon jello on another bowl, and 1/2 box lime jello in another bowl and mix well. Place 1 Tablespoon cake mix in cupcake liner and then alternate colors until 2/3 full. Bake cupcakes according to cake mix instructions for cupcakes. Cool in pan for 5-10 minutes and remove to wire rack to cool completely. Ice with frosting of choice. I used the icing below (Marshmallow Frosting). Place all ingredients (except the vanilla) into a bowl which you can place over a pot of simmering water., or a double boiler). Whisk the egg white mixture constantly over simmering water until the sugar dissolves and the mixture is hot to the touch. (It takes around 5 – 7 minutes). Pour the mixture into a mixing bowl and beat with an electric mixer for 5 to 7 minutes. (Add the vanilla while beating). At first you will think it will not thicken up, but it will, it just takes a while. As its cooling, the mixture will fluff up. The end result will be worth it!